I don’t generally toot my own horn, but this late night dinner was absolutely flavor-packed, delectable and fiery. 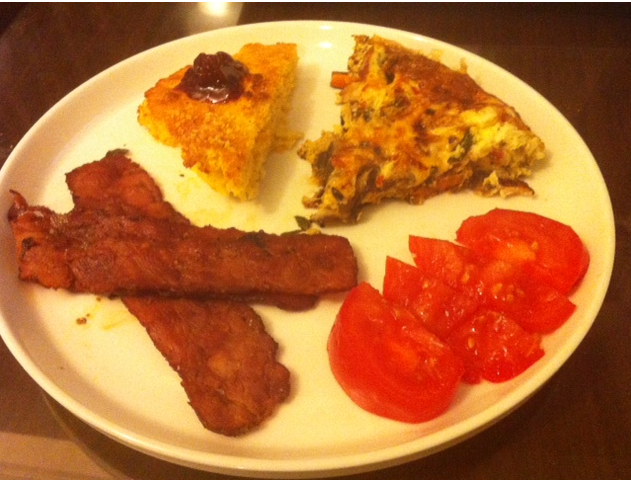 I made Egg Frittata with apple smoked turkey bacon and corn bread. This meal was very easy to make, absolutely delicious, and a perfect ‘breakfast inspired’ dinner. The hardest part of this meal is heading to your local farmer’s market to pick up these ingredients. I went to the Farmer’s market this morning and purchased a ton of veggies, produce and some interesting curiosities. I know it’s a schlep to get to your local market, and generally you should bring cash, but I cannot express how much BETTER the food tastes when you get it fresh and local. It’s no joke. Tonight’s meal was simple, but you will need a few tools. 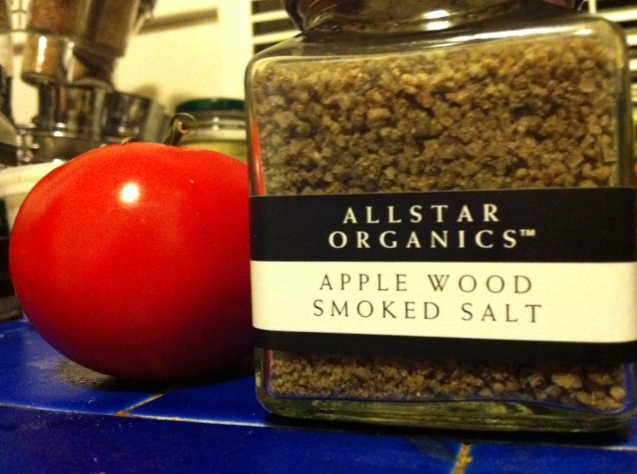 Two Jars pictured above purchased from All Star Organics. 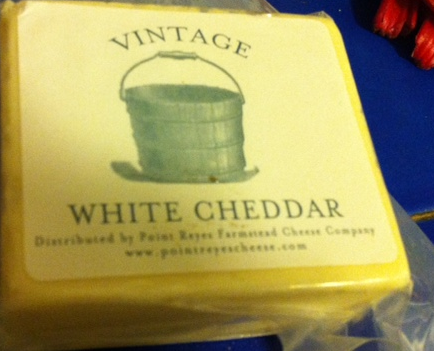 White Cheddar Cheese purchased at the Embarcadero Farmer’s Market. You will only need about 1/7 of the package for the entire Frittata. 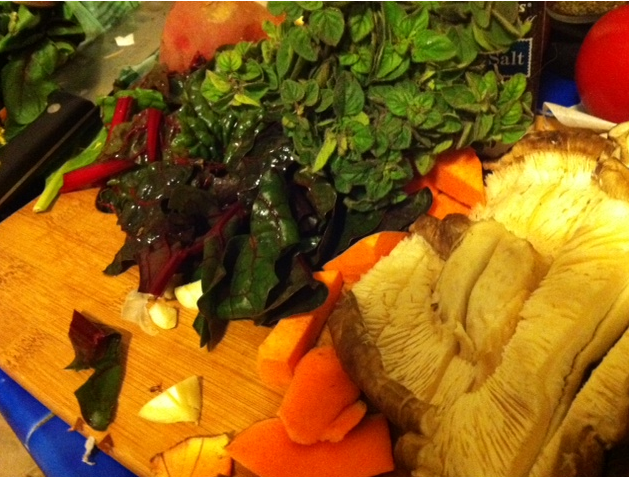 On the right you see shiitake mushrooms, chard, italian parsley and yams. 1. Chop the garlic and the rest of your veggies and transfer to a cast iron pan (round and good size)—>(don’t forget to skin the yams and chop into very bite-size pieces). 2. Carmelize it in a pan with a tablespoon or two of olive oil. 3. Add your chopped onions to the garlic & olive oil and simmer. 4. Add the rest of the chopped veggies, stir around and multi-task by pre-heating the oven to 360 degrees. 5. 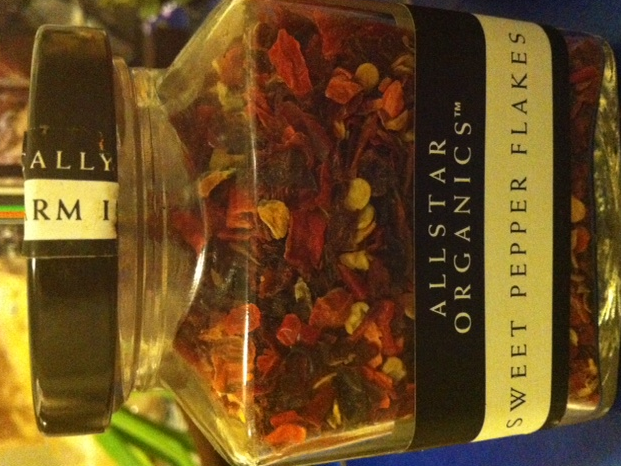 Add all herbs including Italian Parsley, Sweet Pepper Flakes, Salt and Pepper. 6. 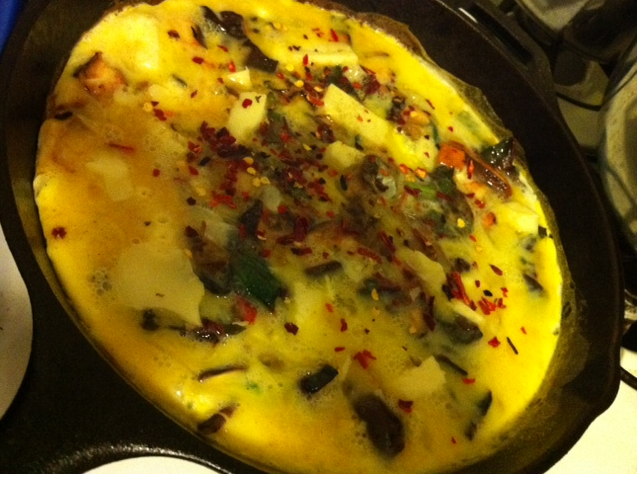 After sauteing veggies pour your mixture of 5 eggs, skim milk (with salt and pepper) into the pan on medium heat. 7. Add a generous amount of cheese to the top equally distributed (not too generous–but generous enough). 8. Let sit for over medium heat until transferring the frittata into the oven (smaller ovens are better because they heat up faster and cook faster). 9. Let bake for about 20 minutes or until top is somewhat hardened (not too hard) and browned. Let cool. Turkey Bacon is a delicious and flavorful source of protein. Trader Joe’s sells wonderful lean uncured Turkey Bacon (not the peppered one since you are flavoring it yourself). 1. Spray olive oil (we want this spray because there are far less calories as opposed to the olive oil in the first dish). 2. Five pieces of turkey bacon (low fat). 1. Brown bacon on both sides. 2. 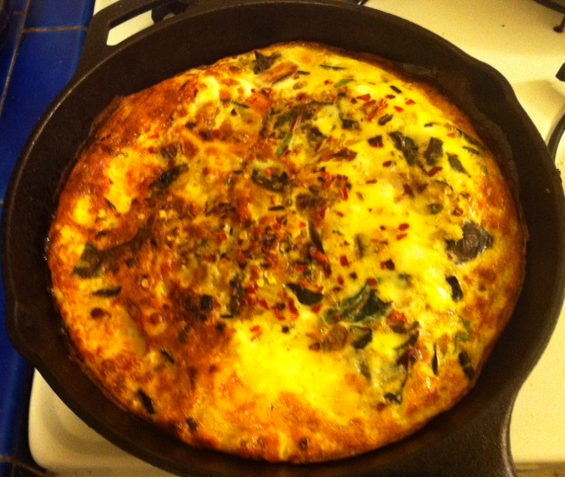 After somewhat browned (not burned but dark/crispy) put into the oven with the frittata to keep warm and crispy. 3. When removing from the oven pad down with paper towel to remove excess oil. 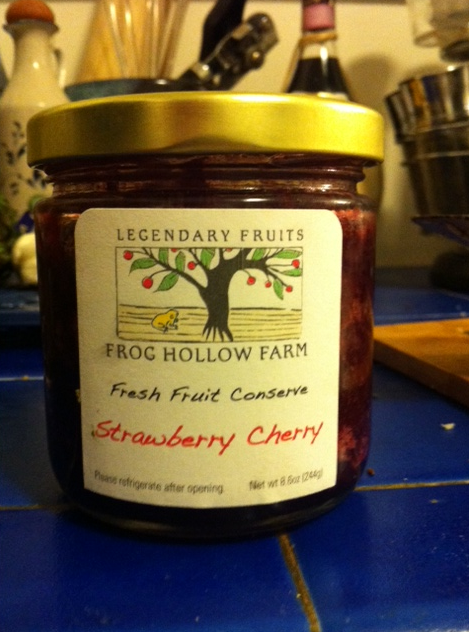 Pictured on the left are the cherry strawberry fruit preserves I bought at the Farmer’s Market today directly from the farmer (Strawberry Cherry). On the right is my cheat product. I made cornbread from a box (shhh). 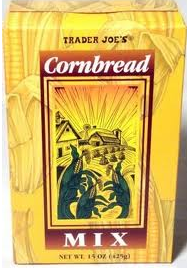 Corn Bread. Corn bread is delicious–it’s a little sweet and grainy–and as far as I am concerned there is no reason you can’t eat it for dinner along with your other breakfast inspired ingredients. I made my corn bread the night before and you might want to do this too since there is a lot going on in this meal (in the oven). Plus this is very easy to make! 1. Dump packet into a large bowl along with eggs, apple sauce (replacing requested vegetable oil) and milk. 2. Stir with immersion blender until consistency is smooth and thick and there are no traces of the powdery corn bread mix. 3. Spray a medium sized rectangular or square pan. 4. Put into the oven at 350 degrees until browned. 5. Remove after between 20 and 40 minutes and allow to cool. You see I topped the corn bread with a dollop of the preserves. I also chopped fresh tomato and added some salt to the top. The Frittata when you take it out of the oven should look somewhat like a pie–with a crisper periphery. You can use your spatula to serve the Frittata.